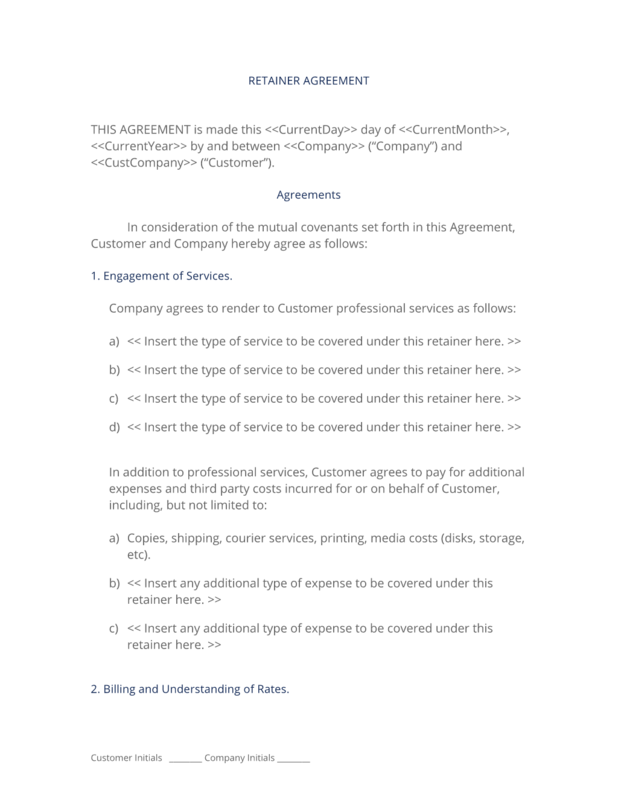 If you are going to be on retainer to offer services to a customer, use this contract. The Services Retainer Agreement outlines the services that will be offered, billing rates, conditions, and cancellation terms. This Services Retainer Agreement is included in editable Word format that can be customized in Word or by using the included Wizard software. How do you write a Services Retainer Agreement document? Insert the type of service to be covered under this retainer here. Copies, shipping, courier services, printing, media costs (disks, storage, etc). Insert any additional type of expense to be covered under this retainer here. Fees are based on the actual time spent on services performed, at a rate of Hourly Rate per hour, billed in quarter hour (25) increments. Travel Rates shall be billed at Hourly Rate per hour and Insert the Travel Mileage Rate per mile. Phone conferences shall be billed at actual time when demanded or scheduled ahead of time by customer. Customer acknowledges that all phone or email time spent working on services for Customer shall be subject to the hourly billing rate. Rates are guaranteed for 120 days from the date of this agreement. Rates may be adjusted after this date without prior approval. All estimates of time to complete a given task are based on our evaluation of the task, the extent of Company's involvement and the complexity of the task to be performed. During the course of working for Customer, additional requirements or problems may become evident or additional work may be requested or required. Customer further understands that all estimates are done using the information made available to Company by Customer and that all estimates may be subject to modification at any time. Company shall submit an itemized account of all time spent on a particular task, and Company shall not exceed Insert Maximum Billing Amount in monthly billing without Customer's prior written or unilateral verbal approval. Should Customer ultimately not engage Company for services, Customer agrees to a cancellation fee of Insert the Retainer Cancellation Fee to be deducted from the retainer, in addition to any expenses or third party costs Company has paid on behalf of Customer. Upon termination or expiration of Agreement, Customer agrees to be solely responsible for any additional third party fees for any service utilized for or on behalf of Customer by Company. Additional expenses may include, but are not limited to: hosting fees, licenses, translations, royalties, talent, and other associated fees. To secure Company's commitment to perform the services listed above, Customer agrees to pay Company Insert the Retainer Contract Fee as a retainer, to be credited against all future services performed. This Agreement contains the entire agreement between the parties relating to the subject matter hereof and supersedes any and all prior agreements, written or oral, between the parties related to the subject matter hereof. No modification of this Agreement shall be valid unless made in writing and signed by both of the parties hereto. In the event Customer fails to make any of the payments set forth on Exhibit A within the time prescribed in Exhibit A, Company has the right to withhold further creative content and services performed for or on behalf of Customer until payment in full is made, plus accrued late charges of 1 1/2% per month. Customer agrees to indemnify and hold Company harmless from any and all claims brought by any third party relating to any aspect of the services, including, but without limitation, any and all demands, liabilities, losses, costs and claims, including attorney's fees, arising out of injury caused by Customer's products/services, material supplied by Customer, copyright infringement, and defective products sold via the advertising or services. Further, Customer agrees to indemnify Company from responsibility for problems/disruptions caused by third party services and contractors that Customer may use, such as media buyers, transportation, merchant accounts, shopping carts, shipping, hosting services, real-time credit card processing, and other services that relate to the execution of the services outlined in this Agreement by Company. Customer grants Company the right to use the creative content, description of services performed, results of services and campaign data as it sees fit for promotional purposes. Company has no responsibility for any third party taking all or any part of the content, ideas, or services provided to Customer by Company. This Agreement shall begin on Current Date and shall continue in full force until terminated by either party upon at least thirty (30) days prior written notice. The complete Services Retainer Agreement - with the actual formatting and layout - is available in this Contract Pack.